Behind the problems that routinely plague organizations and families, you'll find individuals who are either unwilling or unable to deal with failed promises. Others have broken rules, missed deadlines, failed to live up to commitments, or just plain behaved badly, and nobody steps up to the issue. Or they do, but do a lousy job and create a whole new set of problems. 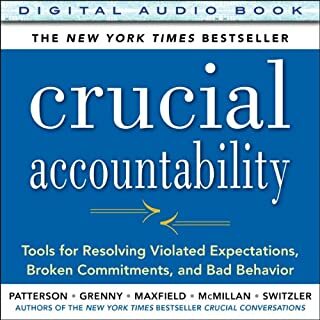 Accountability suffers and new problems spring up. New research demonstrates that these disappointments aren't just irritating, they're costly, sapping organizational performance by 20 to 50 percent and accounting for up to 90 percent of divorces. An employee speaks to you in an insulting tone that crosses the line between sarcasm and insubordination. Now what? Your boss just committed you to a deadline you know you can't meet, and not-so-subtly hinted he doesn't want to hear complaints about it. Your son walks through the door sporting colorful new body art that raises your blood pressure by 40 points. Speak now, pay later. This is an excellent book for enhancing relationships at work and at home. It’s too bad it’s not taught in high school! 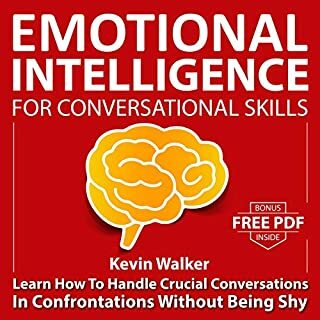 The listening experience is tremendously enhanced if you also read the book as there are a few key concepts that have been edited in this audio version. 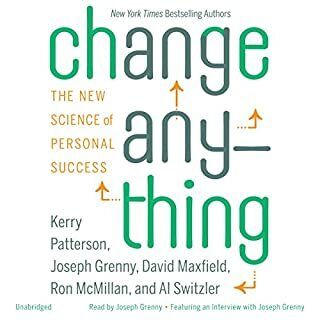 This book is absolutely one of the best I have read or listened to! I highly recommend it. I wanted to read this book, but felt a little self-conscious doing so. Listening to the book was great. I would pause from time to time to reflect on the examples and strategies. I have begun to use several of the strategies - successfully! I will listen to several sections of this book again and again, as I continue to implement some of the techniques. 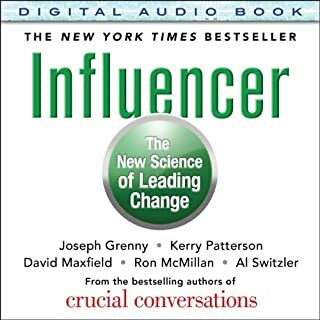 Much more useful for actually making changes in how to approach others than it's predecessor, Crucial Conversations - a book that highlighted the need to consider a different approach to important discussions. 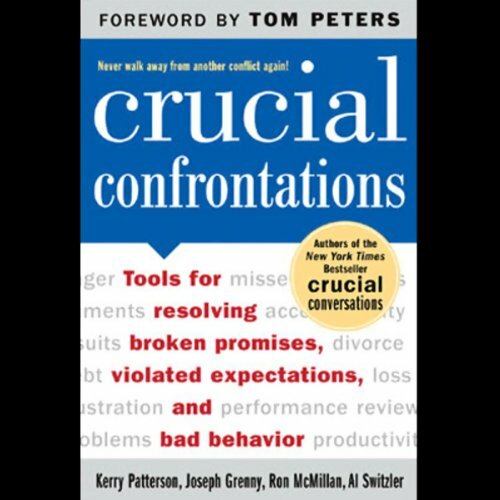 Crucial Confrontations is contains very practical strategies to improving professional and personal communications. Bravo! I was kind of surprised at the reactions to the narrator, whose tone seemed typical for this type of book, i.e., matter of fact. He reads as though he understands what he's saying-- which is the major requirement-- and I don't think a tone of great excitement would be appropriate for the material. (Compare the narrator of "The World is Flat," who maintains a uniformly breathless tone throughout that I found highly distracting.) He does, however, sound sarcastic during his reading of the "scripts" provided by authors when it is clearly not what the authors intended. (On the other hand, when the scripts in fact do call for a sarcastic tone, he's superb.) On the whole, I rarely found myself distracted by the narrator, and, especially since this book is a quite good example of its type, I would not avoid it just based on the reviews of the narrator. I agree with the other listener about the tone of the narrator on this audiobook. His unenthusiastic tone seems dry and I find it hard to list to. 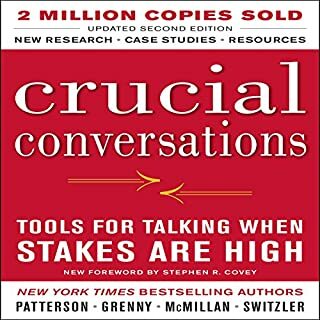 I really enjoyed the authors other book Crucial Conversations and found the female narrator much easier to listen to. 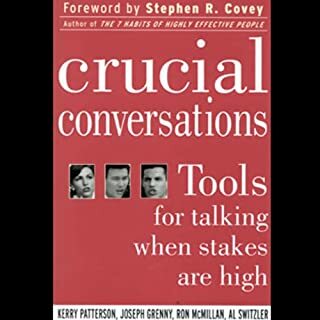 Crucial Conversations focuses on disagreement between two people and how to work through their differences without going to silence or violence. Crucial Confrontations focuses on disappointment of failed promises and missed expectations. Overall I feel both books have a lot to offer. In fact, I bought both books to help me better learn the concepts and reinforce the audio program. If you could sum up Crucial Confrontations in three words, what would they be? This is a follow up book to Crucial Conversations and not a lot of new information was presented. Content was good, but narration sounded robotic. The information was helpful and well thought out. But it almost sounded like the narrator was a computer like Siri. If you have read the Crucial Conversations book, you'll find this is largely a rehash. Audio quality is not great; raspy, rattly voice around halfway mark. Couldn't finish. Thoughtful presentation of factual information with little emphasis on engaging the reader. It is easy to get lost in the lists and listings of inputs and responses. I love the book. hate the narrator. The introduction to the book sounds great. Yes the authors have completed the research, collated their findings but then they don't seem to deliver so clearly. I'm left with some wonderful examples of times when people didn't do the crucial confrontations they should have done but no real inspiration as to how I can improve my confrontational skills. Maybe I just didn't listen hard enough. Somebody with a greater range and enthusiasm in thier voice. What character would you cut from Crucial Confrontations? This is one of the most useful books I've ever read. It states that the audio book is unabridged, but it is shortened and pages are cut out as I was trying to listen to the audiobook and follow the story using a hard copy as well. A bit dissapointed.